Today, we are lucky enough to talk with Grace Marcus. Her story, "86th & First," was a runner-up in the 2008 Spring Contest. If you haven't had a chance to check it out yet, make sure you read it here. Brooklyn native Grace Marcus’ poetry has been published in The Bucks County Writer Magazine, Calyx, and Journey. 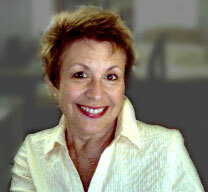 Her novel, Visible Signs, was a semi-finalist in the 2007 William Faulkner Writing Competition. She holds a master's in theatre arts from Montclair University and has worked as an actress, newspaper editor, TV and radio producer, social worker, and waitress. She lives in Bucks County, Pennsylvania, where she is working on a collection of short stories and a second novel. WOW: Welcome to The Muffin, Grace, and congratulations on your win! Where did you get the idea for "86th & First?" Grace: It began with a sense memory of that hallway, which triggered a series of free associations that suggested both the content (the urgency and intensity of first love) and the structure (the rising and falling movement up and down the staircase). WOW: So, your prize winning story came from an actual experience you had! I think many authors have similiar experiences where something happens to them, and they just have to write a story, poem, essay or whatever about it. The last line of your story is exceptional. Was it hard to write an ending to such a short piece? Grace: In some ways it was easier than gathering up all the threads in a long piece, compressing her experience and completing the circle by imagining the exact opposite (and highly unlikely) outcome, the two of them standing there, remembering together. WOW: That's what makes your ending so great--the highly unlikely outcome--which is a technique I think a lot of writers use throughout their entire stories. It's what makes us keep reading. In your bio, you mention that you are working on a collection of short stories. Are these short stories longer than "86th & First?" Are they a similar style or theme? WOW: These stories sound really interesting and moving as you said. We will look forward to reading more from you in the future. Congratulations on being a semi-finalist in the 2007 William Faulkner Writing competition for your novel! Tell us a little about your novel and if you are seeking publication. Grace: VISIBLE SIGNS is set in the aftermath of the 1960s when social conventions such as gender roles and cultural institutions like the church and marriage were in upheaval. It's the the story of two women who made their choices before the 'revolution,' a disillusioned Catholic nun and her childhood friend, an abused mother of three, who break faith with their vows, cast their lots in together and attempt to reinvent their lives. Yes, I am seeking publication. And I am working on a second novel in which the protagonist is (literally and metaphorically) a runner at odds with her grown children and her reckless past. WOW: We wish you the best of luck in finding a publisher for VISIBLE SIGNS. The story sounds intriguing and the type a lot of WOW! readers would enjoy. So, do you enter your work in a lot of contests? Grace: Lately, yes. I have more work to submit since - at the urging of my partner, a writer himself - I've started writing short stories this past year. WOW: Now, that is something we can all learn from, and you said it in just a few simple words. If you write more, you have more work to submit! You have had a lot of interesting careers, according to your bio. What made you want to write? Do these other careers help your writing? Grace: I've had a lot of interesting jobs, too many to count. Not careers. I felt like a malcontent, a misfit, until I realized, rather late in life, that writing was my heart's desire. Beyond a doubt [these other jobs helped my writing]. Each one is a window into a universe with its own culture, jargon, etc., which lends a verisimilitude to characters like the husband in VISIBLE SIGNS, who is an aspiring, talented actor. WOW: Thank you, Grace, for taking the time to share an insight into your writing world with us today. Good luck to you with your future projects, and we hope to read more soon! Nice interview, guys. Grace, since I'm guessing this is the piece I had the pleasure of reading a while back it's most heartening to see it's received the recognition it has. Continued successes both with your short story collection and your novels.